The Padres jumped on the bus for their “second” road game today (first away from the Peoria Sports Complex). Tim Stauffer started, making his Spring debut with 2.0 innings of one-run ball. He allowed two-hits, throwing 24 pitches (16 strikes) during his outing this afternoon. Last year’s Opening Day starter, Stauffer had a strong year in 2011, setting career highs in wins, starts, innings pitched, strikeouts and quality starts. Following Stauffer was newcomer Robbie Erlin. A highly-touted lefty prospect, he was acquired as part of the deal that sent Mike Adams to Texas at the 2011 trade deadline. 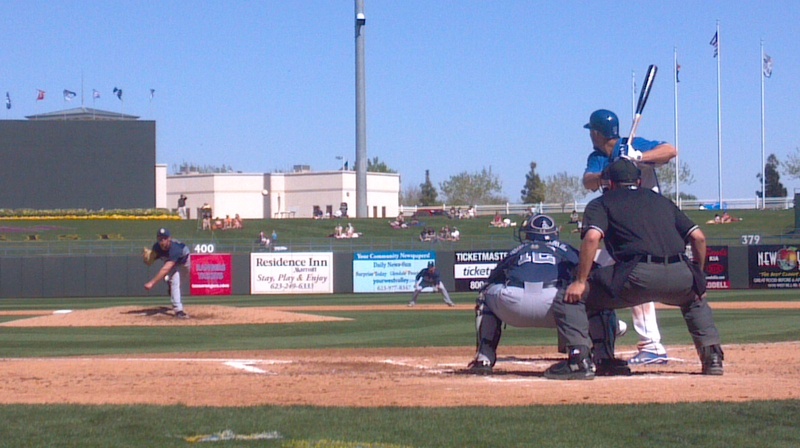 Robbie Erlin fires a strike during his outing today in Surprise. Erlin enters the season rated by Baseball America as the ninth-best prospect in the Padres organization, having gone 9-4 with a 2.99 ERA (49 ER/147.1 IP) in 26 minor league games last year, including a 1-0 record and 1.38 ERA (4 ER/26.0 IP) in six starts after joining Double-A San Antonio. Like Stauffer, he also worked 2.0 innings in his Spring debut today. Robbie Erlin and Joe Wieland, acquired from Texas in exchange for Mike Adams, have each made one start for the Padres’ Double-A San Antonio affiliate, helping the Missions to a three-game sweep over Corpus Christi. Erlin is set to make his second start today. In their first starts, the two newest Padres combined to allow one run over 12.0 innings, surrendering just eight hits and one walk while striking out 13. Erlin tossed 6.0 shutout frames with six K’s while Wieland worked 6.0 innings of one-run ball with seven K’s.